Cardiac muscle is responsible for pumping blood throughout the body. It is a type of muscle tissue that is found only in the heart and is distinguishable from the two other forms of muscle, smooth muscle that moves internal organs, such as the bowels, and vessels, such as the artery walls and skeletal muscle (that powers joints). The cells that constitute cardiac muscle, called cardiomyocytes or myocardiocytes, predominantly contain only one nucleus, although populations with two to four nuclei do exist. The myocardium is the muscle tissue of the heart, and forms a thick middle layer between the outer epicardium layer and the inner endocardium layer. Cardiac muscle is also referred to as the myocardium. In particular, the myocardium is the muscle tissue of the heart and is found in between the epicardium and the endocardium. Similar to other types of muscles, the cardiac muscle is formed by the process of myogenesis and originates from its primordial cell, the cardiomyoblast. The cardiomyoblast develops into myocardiocytes (or cardiomyocytes). The muscles of the vertebrates can be classified into three major types: (1) skeletal muscle, (2) smooth muscle, and (3) cardiac muscle. Skeletal Muscle: This is the tissue that most people think of as muscle. It’s the only muscle subject to control by the central nervous system via the somatic nervous system (SoNS). The somatic nervous system (or voluntary nervous system) is the part of the peripheral nervous system that provides the motor innervation needed for voluntary control of body movement via skeletal muscles. Smooth Muscle: This muscle tissue forms into sheets and makes up the walls of hollow organs such as the stomach, intestines, and bladder. The tissue’s involuntary movements are relatively slow, so contractions last longer than those of other muscle tissue, and fatigue is rare. Each fiber is about 6 microns in diameter and can vary from 15 microns to 500 microns long. If arranged in a circle inside an organ, contraction constricts the cavity inside the organ. 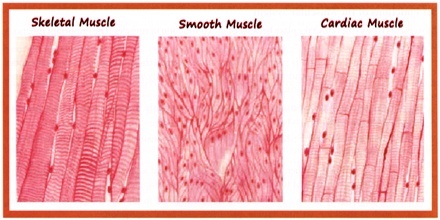 If arranged lengthwise, contraction of smooth muscle tissue shortens the organ. Cardiac Muscle: Found only in the heart, cardiac muscle fibers are cylindrically branched, cross-striated, feature one central nucleus, and move through involuntary control. An electron microscope view of the tissue shows separate fibers tightly pressed against each other, forming cellular junctions called intercalated discs that look like tiny, dark-colored plates. It’s believed that intercalated discs are not just cellular junctions but special structures that help move an electrical impulse throughout the heart. 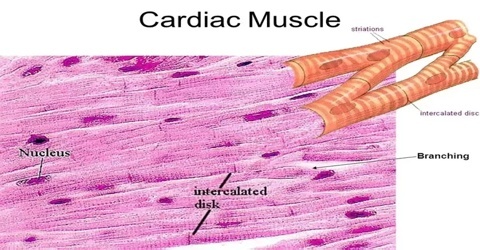 However, cardiac myocytes are narrower and much shorter than skeletal muscle cells, being about 0.02 mm wide and 0.1 mm long, and are more rectangular than smooth muscle cells, which are normally spindle-shaped. They are often branched, and contain one nucleus but many mitochondria, which provide the energy required for contraction. 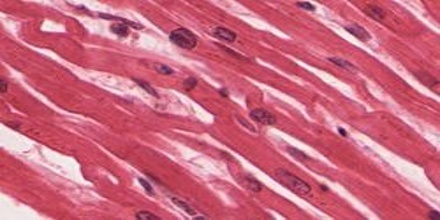 A prominent and unique feature of cardiac muscle is the presence of irregularly-spaced dark bands between myocytes. These are known as intercalated discs, and are due to areas where the membranes of adjacent myocytes come very close together. 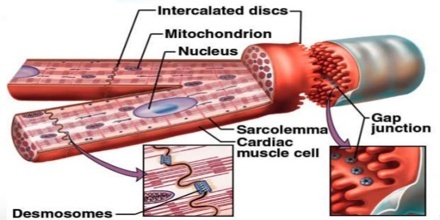 Another histological difference between cardiac muscle and skeletal muscle is that the T-tubules in the cardiac muscle are bigger and wider and track laterally to the Z-discs. There are fewer T-tubules in comparison with skeletal muscle. The diad is a structure in the cardiac myocyte located at the sarcomere Z-line. It is composed of a single T-tubule paired with a terminal cisterna of the sarcoplasmic reticulum. The intercalated discs have two important functions: one is to ‘glue’ the myocytes together so that they do not pull apart when the heart contracts; the other is to allow an electrical connection between the cells, which, as we will see, is vital to the function of the heart as a whole. Reference: encyclopedia.com, medicinenet.com, dummies.com, biology-online.org, wikipedia.